France's presidential election took on the air of a referendum against the extreme right on Wednesday as even incumbent Jacques Chirac's bitterest critics backed him as the only way to stop anti-immigrant leader Jean-Marie Le Pen. Left-wing politicians, hard-bitten trade unionists and trendy media joined mounting calls for an anti-Le Pen vote in the May 5 runoff as youths organized nightly protests chanting "vote the crook, not the fascist!" In his first television interview since his shocking second-place finish in Sunday's first round of the presidential elections, Le Pen vowed he'd rebuild the borders and not let immigrants in, reports CBS News Correspondent Elaine Cobbe. He also promised to send illegal immigrants home, and push for a "national preference" — giving French natives preference for jobs, housing, social security and other benefits. Le Pen also pledged to hold a referendum on pulling France out of the European Union and restoring the franc as the legal currency, and to restore the death penalty. "We didn't survive AIDS until now to see this," the radical AIDS activist group Act Up declared. "Act Up has decided to call to vote Chirac on May 5. With death in its soul." Socialist Finance Minister Laurent Fabius stumbled over his words on RTL morning radio as he stammered out his reluctant call to back Chirac before finally saying: "An anti-Le Pen referendum — that's what it's all about." He picked up the phrase from the leftist daily Liberation, whose editor Serge July wrote: "To hold back Le Pen on May 5, the vote for Chirac must be massive. There's only one way — make the second round an anti-Le Pen referendum." Le Pen's surprise success Sunday was a stinging defeat for Socialist Prime Minister Lionel Jospin and all the leftists who despised his populism so much that they overlooked real grass roots concerns around the country about rising crime. Other strange bedfellows rallying to the president included the pro-Communist CGT union, the satirical weekly Le Canard Enchaine and Eric Halphen, a crusading magistrate who made his name investigating sleaze charges against Chirac. While they say extreme right-wingers now feel they've been given a mandate to openly express their views, and there are reports of people being told they'll soon be on their way "home, many immigrants and French-born children of immigrants take hope from the daily demonstrations against Le Pen, reports Cobbe. Some joke about hiding out in their cellars. Seemingly assured of a landslide victory, Chirac ruled out a television debate with Le Pen, telling supporters on Tuesday evening he would have nothing to do with a hate-monger. "Just as I did not accept any alliance in the past with the National Front, whatever the political price, I will not accept a debate with its leader in the future," he said, calling the contest against Le Pen "the battle of my life." Robert Badinter, a former Socialist justice minister and respected campaigner for left-wing causes, backed the decision. "A head-on debate between Chirac and Le Pen risked degenerating, as Le Pen would want, into a disgraceful brawl whose worst moments would have been broadcast around the world," he told the daily Le Parisien. Joining the chorus calling the presidential runoff an anti-Le Pen referendum, Badinter said: "Chirac was re-elected president on the evening of the first round on April 21." But it was not clear how widespread support for Chirac's refusal to debate Le Pen would be. The National Front leader has won approval for assailing the president over sleaze charges that Jospin declined to discuss in his campaign. 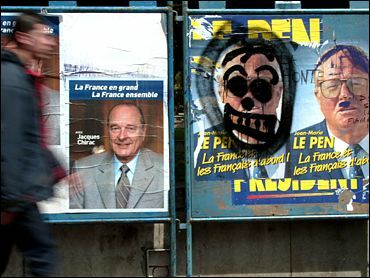 Chirac has used presidential immunity to avoid being questioned about charges of illegal party funding while he was mayor of Paris before becoming president in 1995. A CSA opinion poll for Le Parisien found 69 percent of voters questioned wanted a televised debate, even if as many considered Le Pen's party racist and 76 percent thought it was a threat to French democracy. Le Pen, who won nearly 17 percent of the vote on Sunday compared to Chirac's 19.9 percent, promptly accused Chirac of running scared after the president refused any debate. "If the President of the Republic doesn't have the guts to meet the adversary the people have designated, then he should change the people," Le Pen, 73, told Reuters. Tens of thousands of anti-Le Pen protesters again took to the streets of France on Tuesday, marching in Paris and a host of other cities as they have done daily since Sunday night. In the latest sounding, opinion pollster Louis Harris forecast that 75 percent of the vote would go to Chirac. Le Pen was given 13 percent — down four points on his first round score — with 12 percent undecided or giving other responses. "I bet you I'll be nearer 50 per cent than 20," countered Le Pen in the interview.